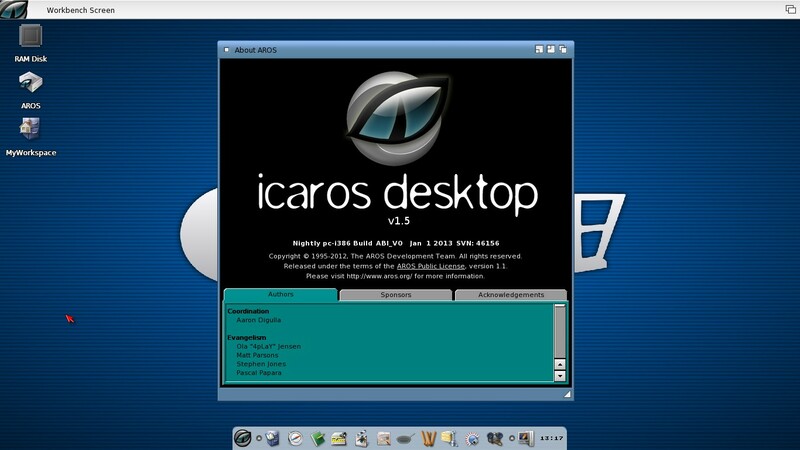 As you may have already noticed, Icaros Desktop 1.5 is ready for download. Please use the "Download" link in the new "Distribution" box from the right column, where you can find also a comparative chart between the three versions we released this time. There is, in fact, a secondary version of the Live! 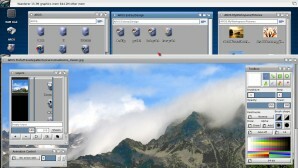 distribution targeted to ARES ONE computers and others that may meet compatibility issues with the new Kernel included in the "regular" Icaros Desktop Live! and Light flavours. Please notice the new Legacy Kernel Edition (LKE) will be only partially supported and won't get any new kernel in the future, since it uses the last one from the old ABIv0 branch. The new kernel, instead, is the one you can find in current nightly builds, and that's been recently backported from ABIv1 by Deadwood. This new kernel brings back to ABIv0 more than 18 months of AROS development which has never been included in Icaros Desktop before, and fixes many little and big issues we had in the past (one of them being the nasty graphic corruption when scrolling window contents in Wanderer's detailed view). You can also notice some differences when booting, since we now use Grub2 v2.0 for the regular distribution (while we kept v1.99 for the LKE edition). So, what version should you download? Obviously, the regular one. But, if you can't boot it or have too much problems with that, the LKE. If you don't want to waste your time, just try the Light version and, if it doesn't work for you, download the LKE distribution instead. Icaros Desktop 1.5 provides a full emulation layer for classic Amiga software, running both games from their ADF files and Workbench applications without the need for original Amiga KickStart and AmigaOS: we use AROS 68K replacement ROM and operating system, running on the new Janus-UAE v1.3 emulator, both in coherency mode or in a separate screen. Under AROS 68K you don't need to manually set the guest resolution anymore (it will automatically adapt to host's one at startup), nor you'll have to choose for locale, input and Zune preferences anymore: our AmiBridge subsystem will keep them in sync for you. Icaros Desktop also provides some famous classic programs like TVPaint, Real3D, AmiBlitz and others. 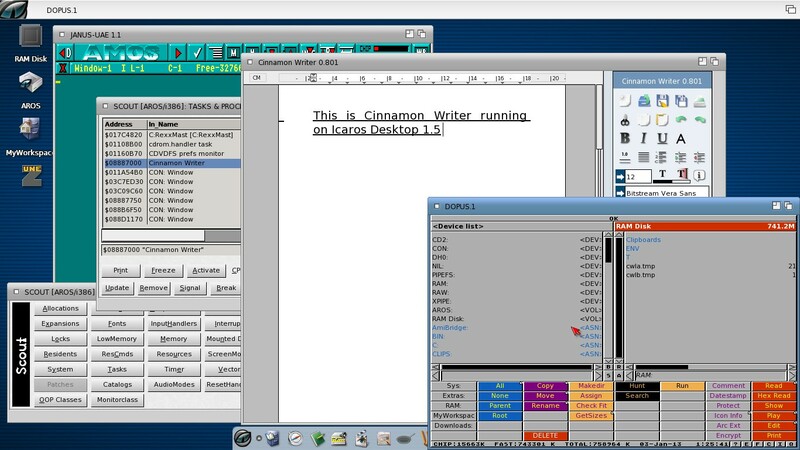 But if the compatibility degree assured by AROS 68K is not enough, you can always integrate Cloanto's Amiga Forever into Icaros Desktop and take advantage of AmigaOS 3.X and original Amiga ROMs. Weren't you bored of Icaros Desktop 1.4 installation times? We were. So we decided to change the way Icaros installs itself on your hard drive, allowing you to choose what programs to install and which not. If you don't need games, Icaros won't install the anymore, neither during its installation, nor when updating the system through LiveUpdater. Our area-based macro-packages include all programs of the same kind, and you can activate or disable them with the new "Custom" installation option. All mandatory files and programs have been moved out from the Extras drawer, and have been included both in the Live! 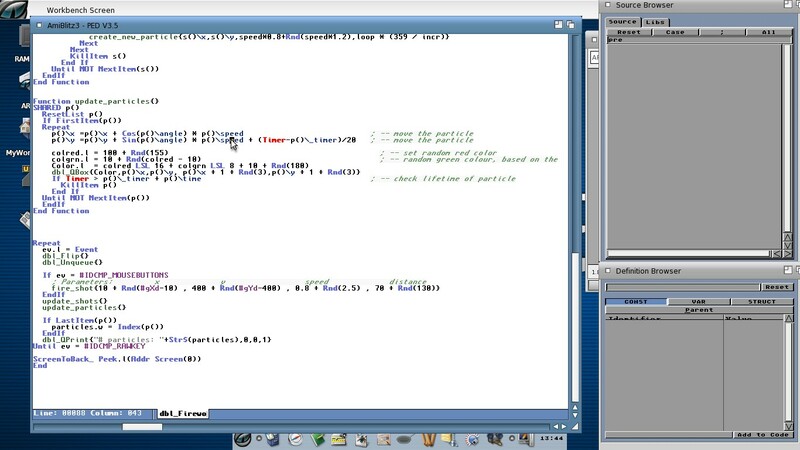 and Light distributions. Moreover, you'll find a little script in the root of the media which will help you create installation USB pendrives. - almost all CLI commands and programs are now located in C drawer.